We invite you to fish with us in Clifden on probably the best fishing waters in Europe. The scenery in this area is spectacular on land and at sea with a great variety of seabirds and wildlife, including seals and dolphins. Individuals are welcome, but why not get a group together (up to 12 persons) and have us arrange an unforgettable day – Fishing, an Island trip and a Picnic on board! At 52ft. the Celtic Queen is Ireland’s largest, most luxurious and best equipped charter angling boat with all home comforts on board. 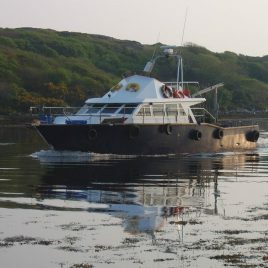 The Celtic Queen is fitted with all the most modern safety, navigational and fish handling equipment.